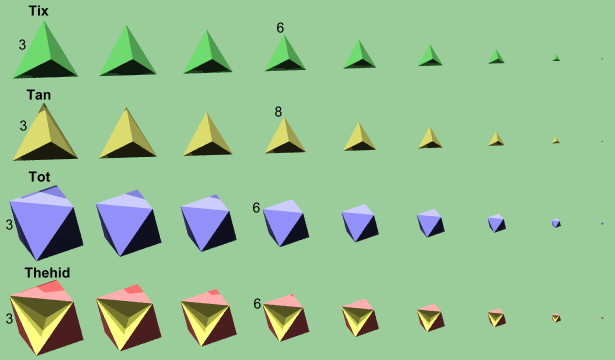 The polyteron truncates are the 5-D counterparts to categories 2 and 7 of the polychora. There are 8 truncates (oooxx) and 4 bitruncates (ooxxo) in this category, where the truncates can be further divided up into three groups - the typical ones (13-16), the quasitruncate (17), and the hin symmetric ones (18-20). All of these are tame except for tohan which is wild. The verfs are now provided. 13. Tix - truncated hexateron. The symbol is oooxx. It has 6 pens and 6 tips and has 30 vertices. Its verf is a tet pyramid. This is the 5-D version of tut and tip. It has hixic symmetry. 14. Tan - trunated penteract. This is the 5-D version of tic and tat. The symbol is ooox'x. It has 10 tats and 32 pens for it's terons and 160 verts. Its verf is a tet pyramid. It has pentic symmetry. 15. Tot - truncated triacontaditeron, or better known as truncated pentacross. The symbol is xxoo'o, it can also be symbolized as xx8o. 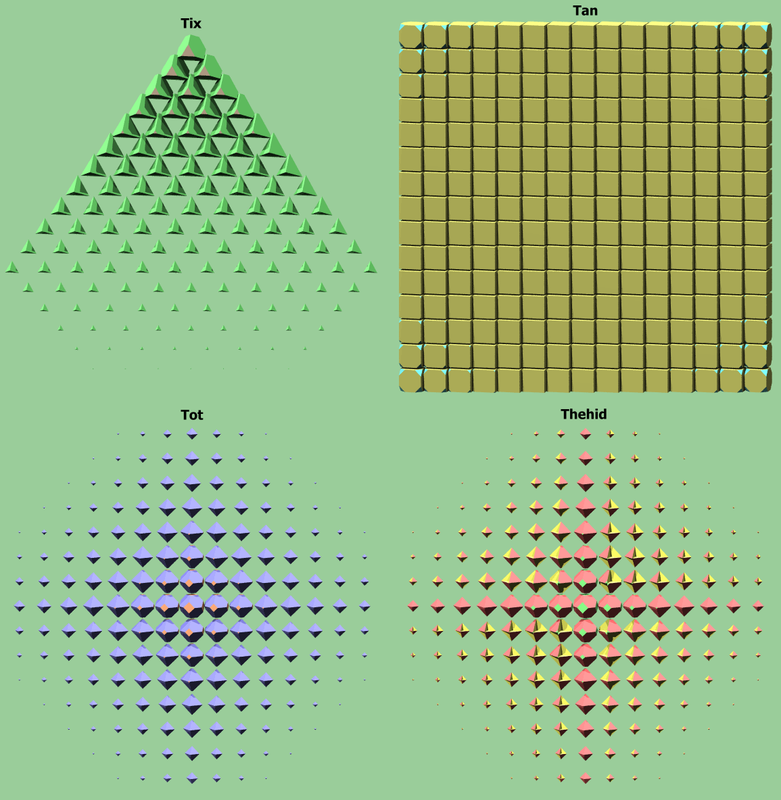 This polychoron is the 5-D version of toe and thex, it has 32 tips and 10 hexes for it's terons and has 80 verts. Its verf is an oct pyramid. It also has one other regiment member - thehid. It has pentic symmetry. 16. Thehid - (THE hid) truncated hexadecahemidecateron, can also be called the truncated hemipentacross - it is the 5-D version of titho. It has 16 tips, 5 thexes, and 10 thoes as terons and 80 verts. Its verf is a thah pyramid. It has "hinnic" symmetry and belongs to the tot regiment. Below are field of sections of the truncates. 17. Quittin - (QUIT tin) quasitruncated penteract. This is the 5-D version of quith and quitit. Its symbol is ooox"x. 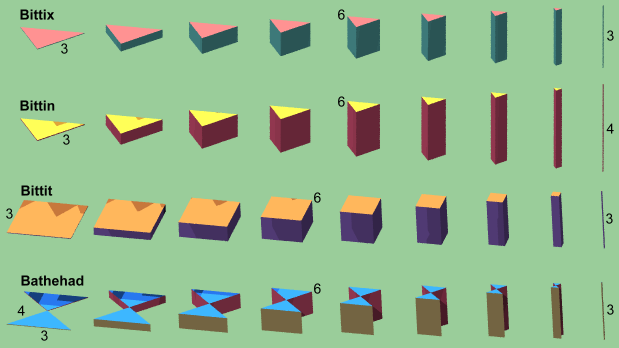 It has 10 quitits and 32 pens, with 160 vertices. Its verf is a squashed tet pyramid. It has pentic symmetry. Unlike its 3-D and 4-D version, this one has holes! 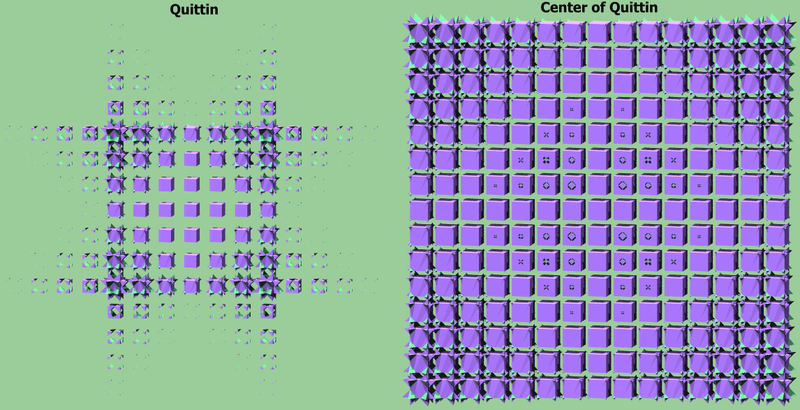 Below is a field of sections of quittin as well as a zoomed in central part to see the holes. 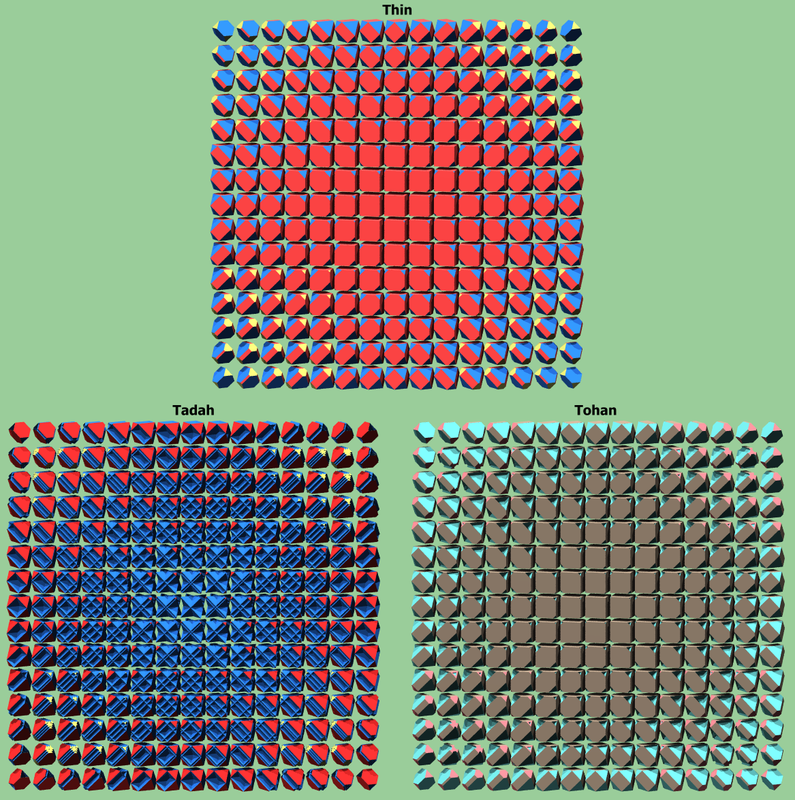 These all have hinnic symmetry with 160 vertices and belong to the thin regiment. Vertex figures are above. 18. Thin - truncated demipenteract. It has 10 thexes, 16 tips, and 16 raps. Its symbol is oox6. 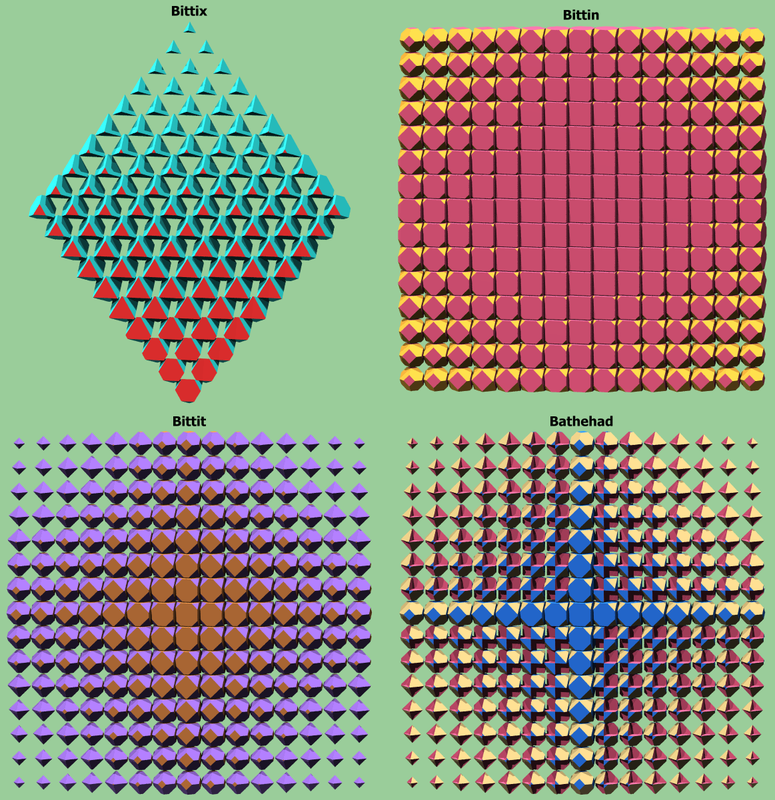 Its verf is a trip pyramid. 19. Tadah - (TAH dah - just like the word you say after a magic trick) truncated dis16. Its verf is the pyramid of firp's verf (3/2 antiprism). It has 16 tips, 16 grips, and 16 firps. 20. Tohan - (TOE han) truncated 16penteract. It has 10 thexes, 16 grips and 16 pinnips. Its verf is the pyramid of an inverted triangle prism (pinnip verf). Below are field of sections of the thin regiment. 21. Bittix - (BIT tix) bitruncated hexateron. Its symbol is ooxxo. It has 6 decas and 6 tips. 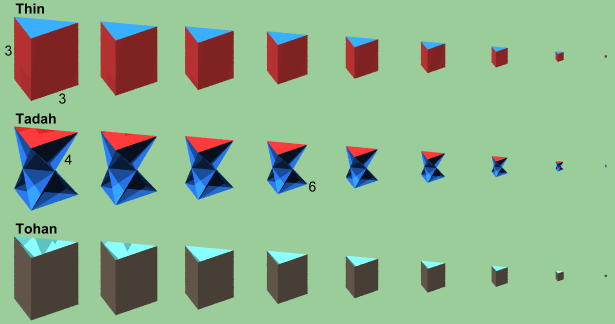 It has 60 verts and has hixic symmetry. Its verf is a trigon-dyad disphenoid. This is the 5-D version of deca. 22. Bittin - (BIT tin) bitruncated penteract. Its symbol is ooxx'o. It has 10 tahs and 32 tips. It has 320 verts and has pentic symmetry. Its verf is trigon-dyad disphenoid. This is the 5-D version of tah. 23. Bittit - (BIT it) bitruncated pentacross or bitruncated 32. Its symbol is oxxo'o. It has 32 decas and 10 thexes. It has 240 verts and has pentic symmetry. Its verf is a square-dyad disphenoid - it also has one other regiment member coming up next. 24. Bathehad - (BATH e had) bitruncated 16hemi10. It has 16 decas, 10 tithoes, and 5 tahs. It has 240 verts and has hinnic symmetry. Its verf is a bowtie-dyad disphenoid and belongs to the bittit regiment. Below are field of sections of the bitruncates. Below shows how the truncates pair up as conjugates. The following are self conjugates: tix, tot, thehid, thin, tadah, tohan, bittix, bittin, bittit, and bathehad. The following are conjugate pairs: tan-quittin.